Woodcock Washburn is a national firm specializing in intellectual property law. Since being founded in 1946, the Firm has provided personal service and trusted advice to clients across a wide range of industries and technologies. 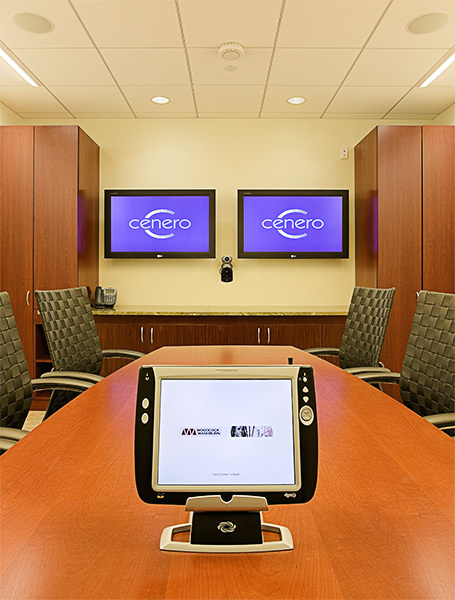 When it came time to upgrade their audio visual and conferencing solutions in their Philadelphia, Seattle and Atlanta offices, they turned to Cenero to design and install systems that would provide all of the presentation and communications tools needed to better support their clients and create a more cohesive culture between their offices. In addition, they needed help adapting a client support process that better served an ever growing enterprise. Given that most of the technical support for all offices originates from Philadelphia, the project discovery process focused on creating standards based environments for each office that could be supported remotely, thus making room functionality and availability more consistent as well as cutting down on ongoing spending. The standard conference room design allows for any non technical user to hold both physical and virtual meetings including contract reviews, remote depositions and more. As with any law firm, audio conferencing is utilized on a daily basis and needs to provide good far and near end audio quality to the participants. To that end, Cenero’s engineers worked with Clear One and Shure to implement a system that exceeded Woodcock and Washburn’s expectations. One major challenge for this project was the large partner conference room that needed to accommodate video and audio conferencing for 80 attendees. As with any room this size, the biggest hurdle is to ensure every partner can be both seen and heard. A multizone audio capture, conferencing and reinforcement system allowed for speakers and microphones to work in tandem providing clear and concise audio to far end attendees. Tandberg’s dual camera video conferencing system integrated with the audio system to provide duplex video, audio and presentation capabilities for all offices. Christie digital’s 4000 ANSI Lumens projector delivered clear crisp images to all attorneys and the Crestron control system combined with a Cenero designed interface allowed for any user to easily operate all systems, including lights and shades, within the space. Cenero’s Constant Connect managed service provides blanket coverage including all preventative maintenance, labor, parts and firmware updates in all three sites thus helping to prolong the life of the systems.